My clothes washer has begun leaking water. It’s a combo washer/dryer. It’s model number FEX831FS0 by Fridgidaire. I’ve taken it apart and noticed where the water was leaking from but am too unfamiliar with how clothes washers work to know why it’s leaking from this particular spot. I would really appreciate any sort of assistance you can provide. Thanks! This is the hole it’s coming from which unless I’m mistaken is the tub. Could it be the seal has broken as this hole looks like it’s supposed to be there? 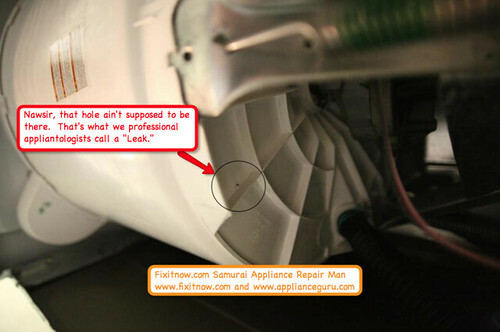 As you surmised, that’s a hole in the washing machine plastic outer tub. It ain’t supposed to be there. Slap a dab of J-B Weld epoxy putty on there. Fix ya right up!